Oh no, another blog about climate change. Is that really necessary? Oh yes. I was passed-on an email with the subject line “Without Trump, Climate Grief* Could Stampede Us Into Dictatorship” (sooo funny ... with Trump we are practically in a dictatorship); but I get ahead of myself. But, you know, what do you do when you come across such an egregious error? Well, if you’re like me, you’re sucked in. So off I went and read the whole article. * the author, Walter Donway, says at the end of his article: “I am indebted to Prof. Charles N. Steele, chairman of the Department of Economics at Hillsdale College, for several ideas in his article “Climate Doom Ahead? Think Twice!” that appeared in Real Clear Energy, December 26, 2018. ... An interesting claim in view of that he "assumes you are aware that the world is within a dozen years of irreversible catastrophe. At least you are if you read the New York Times - or actually pay attention at all to the media." You see "the media", lead by a quality newspaper like the NYT, have no idea ... but an obscure outlet like Savvystreet, with their Alternative Facts, does. Of course we all choose our ideological platforms, don’t we … so it doesn’t really matter, this discussion is all just noise. (Bill Maher has a great take on the issue; before Xmas he said “Talk about politics and climate change over your Christmas dinner? Just. Don’t. Go. There.”) You can never convince anyone that their ideological platform is wrong and yours is right. So there. But pay attention now: There is something that does matter, that is not just noise, and that is really what this blog is about. In the “climate discussion” it is often said the UN and the Intergovernmental Panel on Climate Change (IPCC) falsify records, that there is a “conspiracy” and that - anyway - scientists don’t agree on the details of climate change (see my essay CLIMATE CHANGE DENIALISM). Ok, an egregious error of 60,000 vs 13,898 as opposed to an inconsequential error, corrected immediately (and the correction conveniently not reported) but elevated to “Without Trump, Climate Grief Could Stampede Us Into Dictatorship”. So, who is pushing a political agenda? Who is the demagogue here? But the claim that the UN and the IPCC are falsifying records is not a claim to be taken lightly. The fact is, they don’t. To claim they do, is spin ... ‘fake news’. 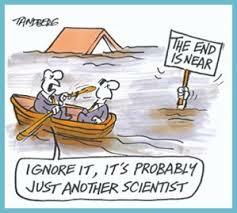 The climate scientists - some 3,000 of them, in about 130 countries - simply report to the IPCC; importantly, the reports are then peer-reviewed before they are re-published in a summary-report, like the “Special Report 15” (SR-15). Climate change denialists look ardently for discrepancies, and when they find them blow them out of proportions, to serve their own ends. What are their ends? Ostensibly they fight “Socialism”. You see, climate change (CC) is an issue that will not be a huge problem for you and me, if you’re over sixty five and live at least 6m above sea level (the predicted rise by 2100 if nothing is done about CC) and away from bushfires, droughts, floods, cyclones etc. We will be dead and gone when temperatures hit a high that cannot be alleviated by switching on the aircon. But there are millions, hundreds of millions of people who are directly affected by CC as we speak: In Bangladesh, the Pacific Islands etc. However, doing so would probably mean that the top end of town would not get their potential tax-cuts. Hence the conspiracy theories and the denunciation that climate change awareness is socialism in disguise. The British TV presenter of nature documentaries told leaders gathered for a UN climate summit that "right now, we are facing a man-made disaster of global scale, our greatest threat in thousands of years." In this context: Do read the story about The Great Filter. Savvystreet and Real Clear in their polemic on Energy think articles like this and the "Climate Grief" they cause may be "scary for kids".